Reward Points | Rewards for every purchase! 10 points are automatically rewarded to your account for every dollar spent on purchase. Earned points are deducted automatically for returned products. Simply log in into My Account and click on "Redeem" under "My Rewards". 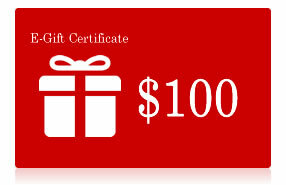 E-Gift Certificates are emailed to you immediately after redemption and can be used towards your next purchase. You can get more than 5% back on your purchase!